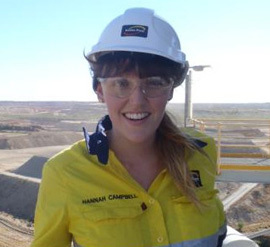 Our graduates gain exposure to both the mining and manufacturing industries while gaining hands-on experience. Learn about the unique experiences of some of our graduates. My role at Phosphate Hill was very challenging, exciting but it also needed a lot of energy, focus and being proactive. The chance to meet senior executives, observing their decision making, the depth of knowledge they had, all meant there is still a lot to learn. My time in the IPL vacation program was spent in Phosphate Hill, located 900 kilometres west of Townsville. I worked an 8/6 FIFO roster during which I worked in the mineral acid plant alongside production engineers and technicians. As part of my long term project I worked in the lab developing and executing experiments to test the productivity of vessels within the plant. I found it was advantageous to spend time in the plant and control room with the operators to learn about the process in detail and to understand performance indicators. My project involved deconstructing an issue within the plant and analysing individual aspects looking for areas of improvement. This included changing operating conditions from the control room to test the performance of different vessels. The hands on experiences were priceless and I learnt to apply my theoretical knowledge to a variety of plant operations. Phosphate Hill has such a great working environment and I particularly enjoyed working at site on weekends as I worked more efficiently with fewer people on site and spent time getting to know the people on my roster. There were always fitness classes and social events on after work - my favourite pastime was running up Tank Hill to look out over the surrounding outback. There is everything you could need and more at camp and not having to cook or clean really makes life easy. I thoroughly enjoyed completing my vacation work with IPL, and I am excited about joining IPL on the Graduate Program. I am looking forward to working on a different site, with my first rotation at Gibson Island as well as having the opportunity to work with a company whose values are aligned with my own. I joined IPL as Mechanical Engineer Graduate in February 2013. For my first rotation I was placed at Queensland Nitrates Pty Ltd (QNP) located near Moura, Queensland. On site everyone was always friendly, greeting me by name and happy to ask about your day. Whilst there, I was based in the Reliability Team and had the opportunity to get hands-on and learn about many industrial and maintenance techniques through direct involvement with my work. Whilst working at QNP, I was able to learn about and work with many different types of equipment and systems. One part of my role in the Reliability Team to was to help out with the day to day challenges in the plant. I was also responsible for the management and implementation of multiple capital site improvement projects. My most rewarding project was the design and fabrication of a transport box for a turbo machinery main gear to Germany, with the gear itself weighing more than 3.5 tonne and valued at $550,000. While at QNP, each day would offer new learning experiences, whether it was from my work or from the others around me. I had my own mentor, with who I had regular meetings to aid in my development and to provide feedback. I also had the opportunity to participate in many forms of training and professional development, in and out of my core discipline. Working in a smaller plant allowed me to be proactive and get involved in many different areas of the plant and business. On many occasions I was able use various techniques learnt from University to solve plant problems and ultimately implement solutions, which I have found to be very rewarding and beneficial to my growth as an engineer. I am looking forward to my second rotation, where I will be located at Gibson Island working in the Ammonia Plant.